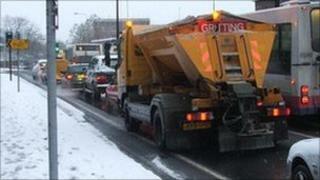 Suffolk's gritters have already spread as much salt since November as they did throughout last winter. The county council has used 12,000 tonnes on the roads since the cold weather began. It has 6,000 tonnes left and is buying an extra 5,000 this week, said Graeme Lewin, lead officer for winter services. "We are concerned because we don't know when this weather is coming to an end," he said. "We're as prepared as we can be. "The tonnage we've got coming in now will certainly get us through Christmas and into January." Mr Lewin said the council stockpiled 18,000 tonnes, which was 4,000 more than during the winter of 2009 to 2010.